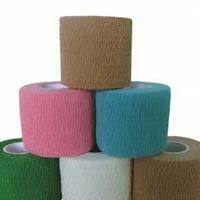 Our company is a distinguished Manufacturer, Supplier and Exporter of Rayon Strapping Tapes. Our Tapes feature high tensile strength and strong adhesion. Tapes offered by us are waterproof and latex free. When it comes to bulk orders of the Tapes, you can completely rely on us. One can obtain these at competitive rates from us. Founded in 2002, SAMS'S INTERNATIONAL is a renowned organization, occupied in Manufacturer, Importer, Exporter, Trader, Supplier, Retailer, Wholesaler and Service Provider of Healthcare Equipment, Physical Medicine and Rehabilitation, Orthopaedics and Trauma Care, Sports and Fitness Equipment, Dietetics Anthropometry, Dental Products, Neurology Product, Critical Care Products, Anatomy Physiology, Pediatrics Products, Respiratory Medicine, Laboratory Equipments, Anesthesia Products, Dermatology Product, Physiology Product, Rescue and Disaster Management Equipment, Obstetric and Gynecology, Beauty and Slimming Equipment, Physiotherapy Service. These products extremely utilized by customers due to their features and low rate. Our series of products is made employing the advanced components and advanced technology. Due to high demand, professionals develop these products in diverse configurations that meet on customers demand. We have advanced development unit which is separated into varied divisions to develop these products as per universal industry parameters and norms. Our manufacturing unit is rooted with the sophisticated machines and tools that assist us to take massive orders of client and complete them within particular time frame. Quality professionals carefully check these offered products on different industry parameters by employing the sophisticated testing techniques.